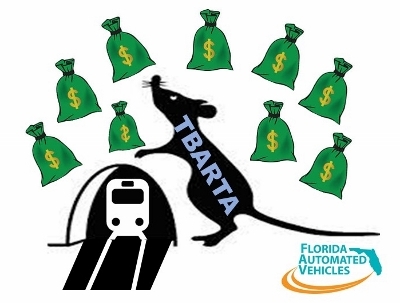 Twenty-five million dollars on a matching basis to the Tampa Bay Area Regional Transit Authority for the design and construction of an alternative transportation system, as defined CS/HB. One dollar in local or private matching funds must be provided for each dollar distributed under this sub153 subparagraph. Federal funds may not be substituted for the local 154 or private matching funds. Even with a dollar for dollar match requirement that is currently in the Bill, which in all likelihoods could quietly disappear, the TBRATA folks are much more creative at dealing for dollars than they are at building transportation systems will find some way to get their paws on the $25 million.